The first snow didn’t settle onto the ground. That night, the clouds broke into minute snowflakes as we stepped out from the house. And just like I did last year and the year before that, I stopped and stared into this black and white kaleidoscope for what could have been a nightlong, a lifelong really. It’s been snowing every day ever since. Flakes fluffy as cotton balls. At times for seconds, other times for hours. And although it still hasn’t turned our streets white, I have a feeling it won’t be long before it does. There are the lamps on every windowsill, turned on as the sun sets, slightly earlier with every day that passes; for now, around half past four. There are the candles we burn, and the evenings spent threading rönnbär [rowan berry] into garlands. There is the soup plate that stands on our kitchen counter, by the right of the sink. In it, pinecones I collected during a walk in the forest, perhaps the last one before winter sets in. I turn them around every morning as I wait for my coffee to brew, and they open into an almost fractal pattern as they dry. There are the biscuits we bake. An early batch of pepparkakor [gingerbreads] – adapted from this recipe, more to come later -, crisp chocolate drömmar [dreams], made with hjorthornssalt [ammonium carbonate], and of course, cinnamon shortbreads. We keep a small tuperwareful of each in the last draw of our freezer, safely nested among the neverending bags of berries we picked under a summer that never really happened. But that’s another story for another day. In the meantime, here is to winter! 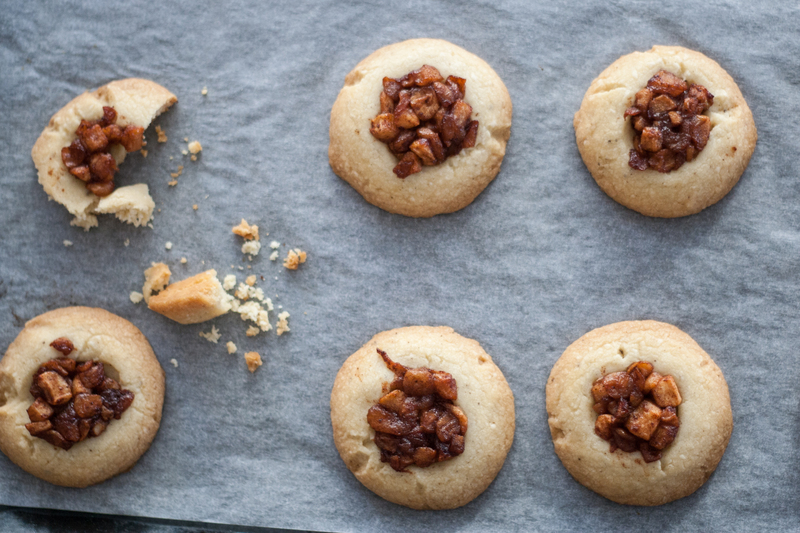 These shortbreads were inspired by K., who suggested on one of our weekly trips to the store that we make biscuits filled with apple compote. We put a kilogram of small Swedish apples in our basket, along with a bag of caster sugar, and a block or two of butter. 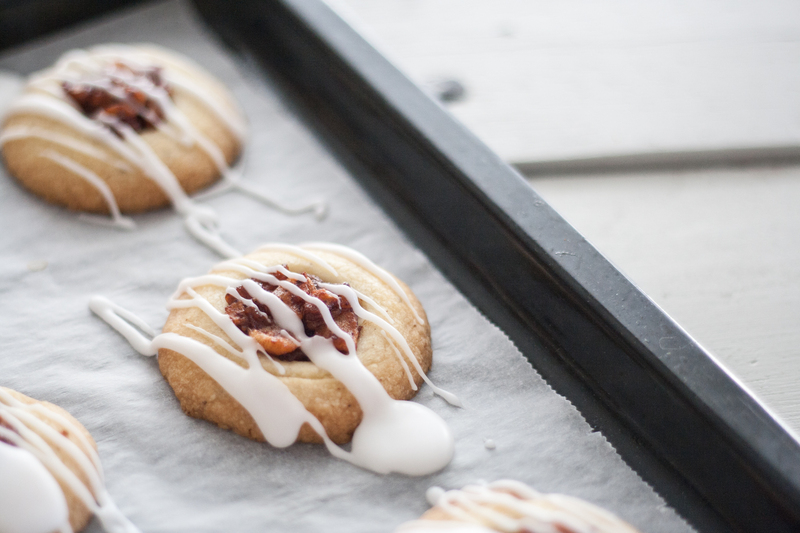 By the time we came home, we’d formed a pretty clear idea of these biscuits, even going as far as naming them apple pie shortbreads; because it is, essentially, what they are. The dough, made short with a lot of butter and a generous amount of starch is the updated version of this recipe by Leila Lindholm. Depending on what’s in my cupboards, I’ll make it with either potato starch or cornflour, and so should you. 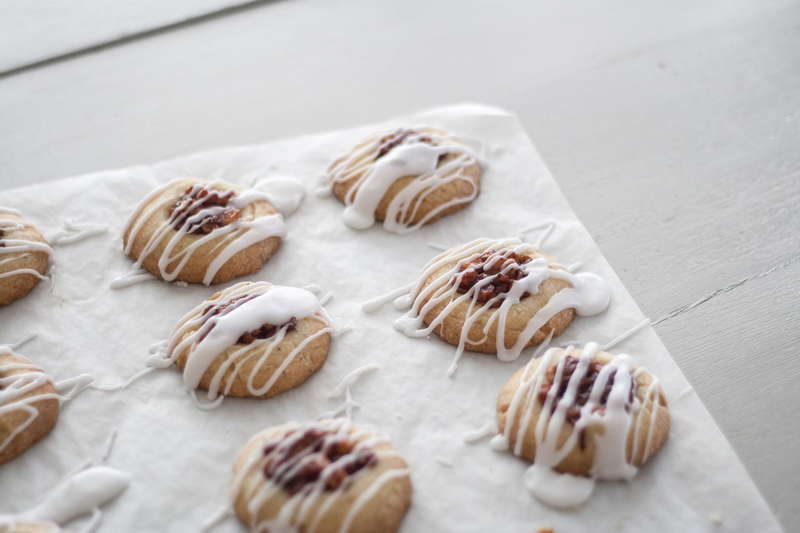 It’s a dough I use for many biscuits: from cinnamon shortbreads to hallon [raspberry] thumbprint cookies. A firm favourite in our house. The compote is cooked quickly over medium heat until the apples have released their juices, and begin to soften. You can use any apples that hold their shape well during baking. The list is long, but I’d suggest braeburn, royal gala, fuji, golden or granny smith, just to name a few really. You could pass on the glaze, although I think it is a wonderful addition, both in terms of sweetness and texture. As mentioned in the recipe below, I would however leave it out if keeping these in the fridge or the freezer, then glazing them right before they’re ready to be served. And as always, I bake my biscuits quite darker than the Swedes usually do; perhaps a French trait I can’t seem to rid of, I truly find that it makes for a better texture and a slight caramel flavour. Line two baking trays with baking paper and preheat the oven to 180°C/fan 160°C. Whisk the flour and potato starch to combine, then set aside. Cream the butter, icing sugar and salt in a stand-mixer fitted with the paddle attachment. Add the flour mixture and mix on low speed until a dough forms. Roll the dough into a log and cut it into 24 even slices. Roll each slice into a ball, then flatten it onto the prepared baking tray. Gently dent each shortbread using your thumb or the bottom of a small glass. Repeat with the remaining slices, and chill in the fridge while you get on with the apple compote. In a frying-pan set over high heat, melt the butter until it just starts to foam. Add the diced apples and stir to coat. Add the sugar, cinnamon, and salt, and reduce the heat. 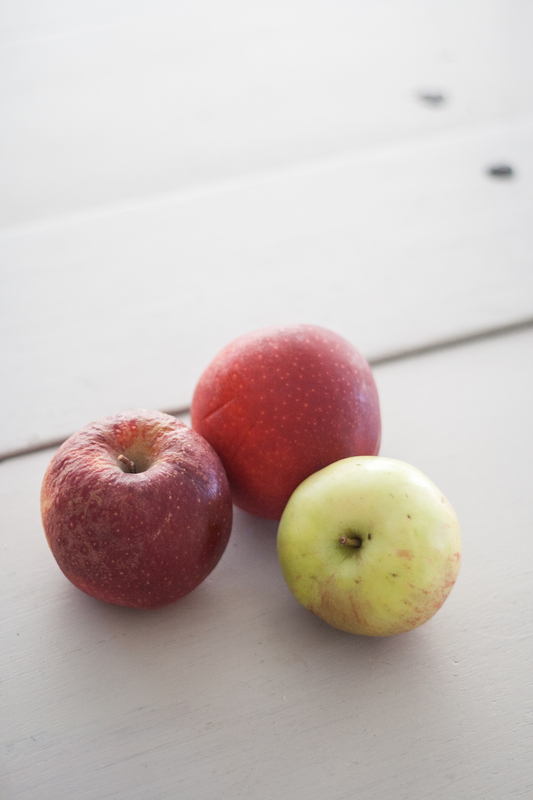 Cook until the apples start to soften, around 8-10 minutes. Immediately transfer to a small plate and set aside to cool down slightly. Fill each indent with a fat teaspoon of apple compote. Bake in the pre-heated oven for 20 to 24 minutes, or until golden-brown. Allow to cool down completely. Make the glaze by mixing icing sugar and just-boiled water until it has a firm pouring consistency. Drizzle the glaze over the cookies and allow to set for 10-15 minutes. Stored into an airtight box, these will keep for a week at room temperature. 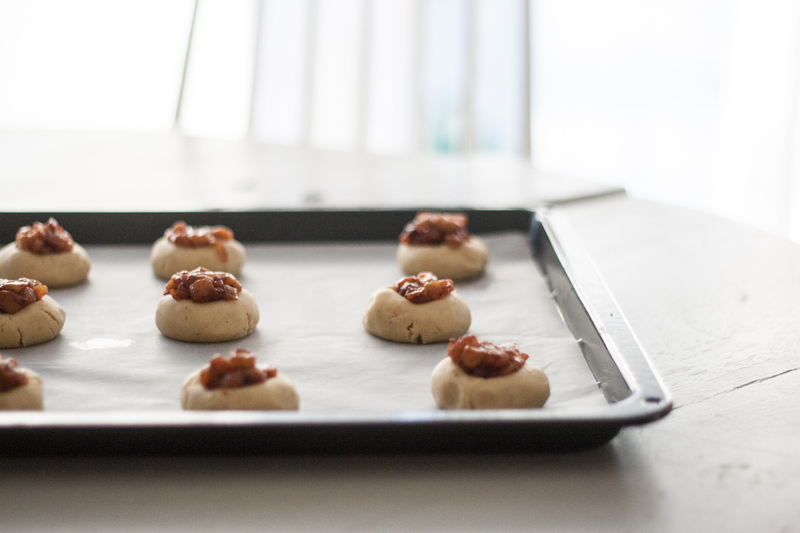 Without the glaze you can keep the shortbreads for a little over a week in the fridge and up to three months in the freezer. You generously increased the butter from the Cinnamon cookies. Cant wait to try! I think I just gained 10 pounds of goodness. Can’t wait to cook this delight. Amazing recipe!